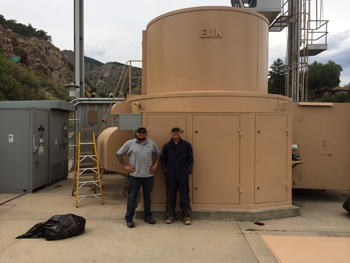 Two members of the Flatiron crew pose with the Big Thompson Power Plant shortly after repainting it. The Big T Plant was restored after flood damages last year and returned to service in July. It got a new paint job right after Labor Day. Reclamation seeks public input on request for permit by private club at Horsetooth Reservoir. The Eastern Colorado Area Office manages two large diversion projects, the Colorado-Big Thompson (C-BT) and the Fryingpan-Arkansas (Fry-Ark) as well as the Leadville Mine Drainage Tunnel and Treatment Plan which removes heavy metals resulting from mining activity before they can enter into the Arkansas River. On average, we divert 230,000 acre feet a year. Water Ops: Reclamation water levels in Colorado.